This year our annual Post Pals summer party is being held on Saturday 1st of July. All our Post Pals families, past and present, and also all our volunteers are welcome. 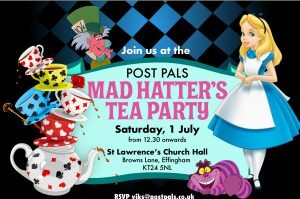 We have lots happening at our Mad Hatter’s Tea Party including Princess make overs, Jedi training, a huge selection of giant inflatables, Photo Booth, slime table, giant bubble station, an unicorn who you can take for walks and decorate its mane and of course the craft based tea party! Next door is a bigger hall with playing fields which isn’t us! We have a gate to our car park and will have our banner outside. There is wheelchair access to everything including toilets and disabled parking in the car park. We have a changing bench and one of our Pals is bringing a portable hoist should you wish to bring a sling. We are very sad to say our Pal Ebonie passed away. 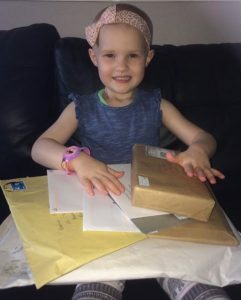 Thank you to everyone who sent post to Ebonie and kept her smiling through her illness.